Exploring is part of the Boy Scouts of America for young men and women ages 14 - 20. The Lexington County Sheriff’s Department Explorer Post #106 meets on Tuesday evenings during the months of September through June each school year. The Lexington County Sheriff’s Department Explorer Post competes annually in a state competition, provided funding is available. The competition is usually held in June or July. A team will be selected by the Post Advisors based on the knowledge and the proficiency of the individual explorer. This program is designed for the elderly, handicapped or those who have severe medical problems. This person is usually alone during the day or lives alone. Background information determines qualification for Phone Guard. When accepted for this program telephone contact is made daily by the individual with the Sheriff’s Department. If contact is not made, a deputy is dispatched to the residence. Helps serve the senior citizens of Lexington County. This program provides senior citizens with 10 locations in Lexington County to deposit any unwanted, outdated prescription medications for disposal. Ten locked boxes are readily accessible to the public from 10 a.m. until 3 p.m. weekdays. Too often the victim is forgotten. But our Victim Assistance Officers will see that you are kept advised regarding your case and YOUR LEGAL RIGHTS. In cases where compensation is available, we will be there to ensure that you will not be forgotten. Information - For inmate custody information, call toll-free 1.866.727.2846 and follow the prompts. SAVIN will allow you to confirm that an offender is in jail and provide you with important custody status information. You can also register at www.vinelink.com. Notification - Callers can then choose to register for an automated notification call when there is a specific change in the custody status of an offender. To register, callers simply enter the phone number, including area code, where they want to be reached. Callers will then be asked to enter a Personal Identification Number (PIN) for use during notification. The service will automatically call when a change in custody status occurs. Helps emergency personnel with critical information, such as a description of your residence, and the names and phone numbers of family members to contact in your time of need. You can inform Fire Service or ambulance personnel about someone living with you who might have difficulty communicating or moving about. Enroll in the Lexington County My 9-1-1 and Vial of Life program! Vial Of Life works in conjunction with My 9-1-1 by providing responders with life-saving medical information about the medications you are currently taking, allergies or any special medical needs you or someone living in your home might have. The participant is given a plastic vial that contains important medical information provided by the participant, and it is placed in the refrigerator. It is retrieved by Emergency Services personnel upon arrival at the home. This program is VOLUNTARY. The information you provide is CONFIDENTIAL, and it will only be used by Lexington County public safety personnel to protect you and your property. 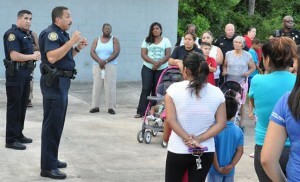 Generally, 50 percent of the residents in a neighborhood are needed for a successful Neighborhood Watch program. A representative from the Lexington County Sheriff’s Department will present an overview explaining “How To Organize A Neighborhood Watch.” All Neighborhood Watch groups are required to meet once every three months. This program is designed to acquaint the residents of Lexington County with the goals, objectives, organizational structure and general operating procedures of the Sheriff’s Department and to promote good will, mutual understanding and community support. Conducted periodically, the program consists of nine sessions, with a total of 27 hours of training. The sessions are held on Tuesday evenings. Notify the Sheriff’s Department when you will be away from your home for extended periods of time. Our deputies will come by to help keep it safe and secure. A crime prevention officer will walk with you through and around your home or business and provide you with an assessment of any security weaknesses and recommend steps to correct the problems noted. There is no charge for this service.